So awhile back I was having lunch in a quaint little town not very far from my home. I had planned an outing with some of my work friends so we could enjoy a fabulous lunch and some shopping in what I assumed would be unique little shops. They were definitely unique. They were also almost entirely resale clothing shops specializing in fashions for the over 50 or jewelry stores. I probably should have been tipped off the moment I walked in to the cafe we ate at and saw the art in the gallery portion. Now, I’m not a total and complete art snob, but wow…we spent a good portion of lunch deciding which paintings we would give each other as ironic gifts. I got the creepy Marinette one, so I think I came off the biggest loser there. The only store I was even remotely interested in was the wine store. Not because I’m keen on wine (I actually really don’t care for like 90% of it–it’s only the sweetest dessert wines for me), but because like all good wine shops, it also had lots of gourmet foods. I can’t help myself when I’m in this kind of shop. I simply adore all the jars of fancy mustards, bags of exotic chip-like creations and assorted jams and jellies, most of which I would never, ever put on my toast. I go a bit gaga over coolers filled with cheeses I’ve never heard of, let alone tasted. And, I go sort of weak in the knees when I see some sort of new chocolate creation. This store had everything I love looking over, including some funky looking chocolates from Gourmet Divine. The only link I could really find for it was this one, which I probably should have taken as a sign. I also could have taken the display of chocolate wine sitting right above the shelf with these chocolates as some sort of divine intervention (no pun intended) trying to stop me from purchasing the shiny, red rock-coated chocolate, but my love of all things cocoa and my intrigue to find out just what those pebble-like substances were over-powered me. Now, I hate to speak ill of anything chocolate, but I may have to make an exception here. Although I’m not totally sure how I’m going to describe it as words, quite frankly, are escaping me. I’m not sure I’m speechless, but the only think that is really coming to me mind is, wow…what was I thinking? 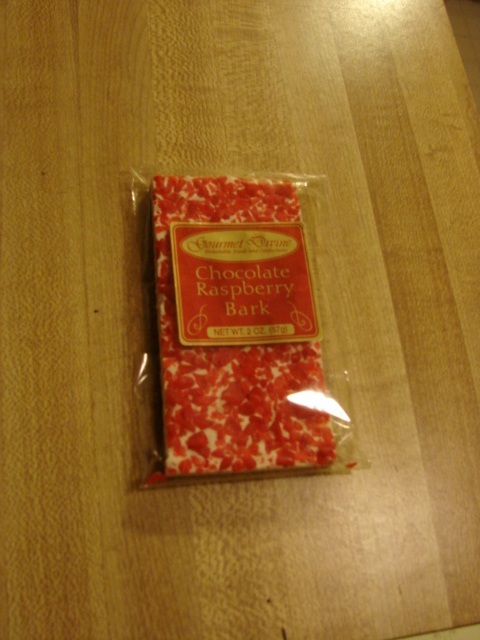 Being a near worshipper of chocolate and raspberry mixed together, I grabbed the chocolate raspberry bark. I knew I was asking for trouble the moment I laid eyes on it. The spikey bits on top reminded me of crushed up Lifesavers and I had a feeling this was not going to be the chocolate-fruit mix I usually adore. But, I bit in anyway. I was pleasantly surprised that they were not hard bits of raspberry crystal. I was perplexed by that fact, but a little relieved. Rather than crunching, they were chewy. Which, on second chew, when they were getting stuck in my teeth, I realized should not have been any sort of comfort to me. They were definitely tart like raspberries should be. 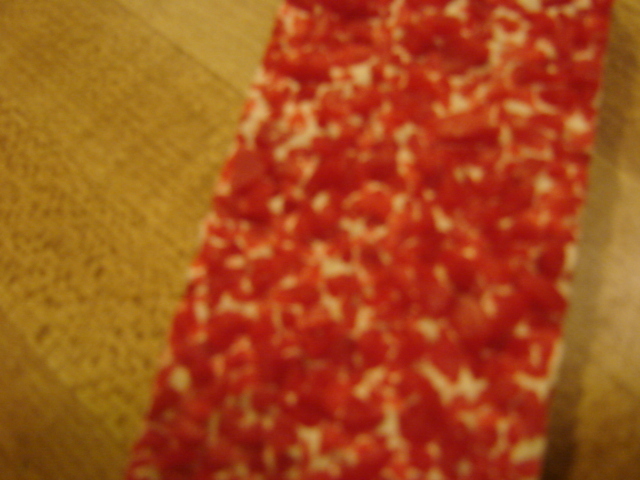 However, they were also sort of overly sugary, so they very much tasted like sugar trying to masquerade as raspberry. I can take this when it is in a circular form and is intended to be sucked on (via Lifesaver), but not when I’m expected to chew it up with a mouthful of chocolate. The chocolate itself (which on first glance looks like a layer of white on top a layer of milk), is completely lost in the overpowering fake raspberry taste. I think what I initially took for white is actually supposed to be some sort of raspberry flavored chocolate, but honestly, neither layer tasted like much to me. The chocolate was crumbly rather than melty and didn’t really have a distinct flavor. I think the makers may have been relying on the unforgettable wave of raspberry to make the taster completely forget there was even supposed to be any other flavor mixed in. For anyone who has missed my subtle hints here, I did not like it one bit. Aside from a sort of eye catching stained glass looking novelty appeal, I can’t really say much nice. The after taste of this raspberry imposter lingered in my mouth for far too long. Although the company makes the bars in eight other flavors, I can’t imagine myself having a favorable reaction to any of them. I like chocolate and fruit, but I like chocolate and real fruit, not candied fruit-inspired flavoring. I had every intention of being a tad timelier with this post. I bought a sampler box with one of each of the new truffles from this collection when it came out so I could eat ’em and review ’em before most people even knew they’d hit the market. I was gonna be on the ground floor. Then midterms hit and my stack of grading nearly toppled over and buried me. When I got out from under it, I realized it wasn’t actually the grading that was suffocating me, it was the fact my sinuses were so clogged up I no longer had a working airway. Not that it mattered since they were also causing my head to pound so hard focussing on anything for more than about 30 seconds was impossible. On top of it all, my taste buds were shot and I had one more truffle to sample before I could write this review. 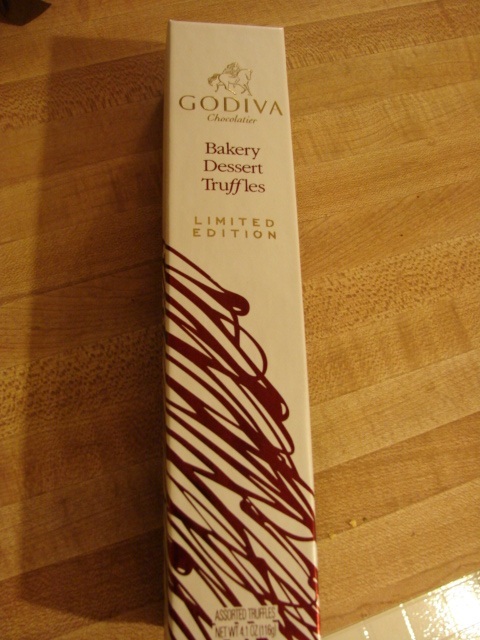 So, here I am now, knowingly late, rightfully penitent, but with my views on the newest collection from Godiva. From the moment my eyes saw the tiny bits of chocolate love in the display case, I knew I had to have them. The manager of my particular shop and I are basically on a first name basis, so he was quick to point me in the direction of the box which not only had the entire collection, but also came in a darn pretty box. I’m a sucker for nice packaging, so I scooped one up. I was quite excited to try this collection since all of the truffles are based on desserts I am pretty darn fond of. In typical “best for last fashion,” I started my taste odyssey with the truffle I thought I’d like the least: Tiramisu. Now, I know probably half my reading population has just turned their back in disgust and dismissed me as a heretic. However, please read on just a teeny bit further so I can explain what I know is obviously a dessert faux pax on my part. I don’t like coffee. Not even a smidgen. I’ve been told repeatedly (mostly by my husband) that this is a major character flaw. Somehow he still finds it in his heart to love me. In my defense, it is not really my fault. I blame my parents entirely. I have that gene which makes coffee taste horrendously bitter (yes, this is a real thing…I was once a guinea pig in a student science experiment where I had to put a piece of paper on my tongue–and yes, I double checked it was legit before I did it–and after about half a second I wanted to scrape it off of my tongue because it was so foul. This was how I learned that some of us are genetically predisposed to hate coffee. I am one of those people. Love me or hate me, it’s just who I am). Wow, but I really digress there, huh? Anyway, back to the Tiramisu. I do actually like the dessert ok. It’s not one I’d ever order for myself, but if friends are getting it and offer to share, I will indulge my sweet tooth. 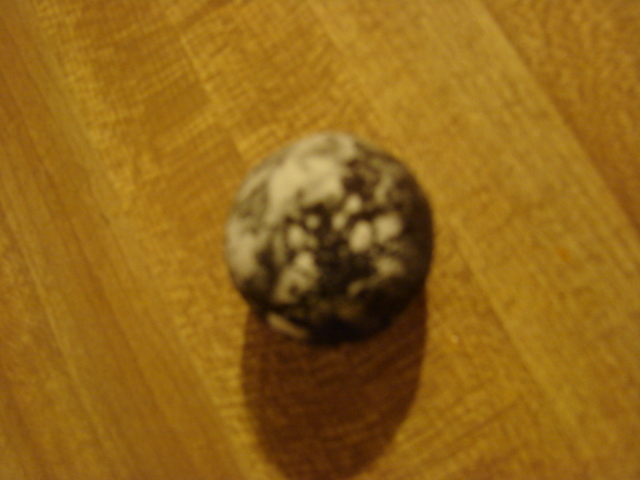 As for this particular truffle, it did leave a good first impression on me. From a purely visual standpoint, I thought it was cute the way the little chocolate shavings stood out against the white chocolate shell. The first bite was pure, creamy marscapone, which melted on my tongue. The espresso side of the truffle has a hint of coffee without the bitterness, which thrilled me. It tasted far more like marscapone than espresso. Together the two halves mixed for a creamy treat that seemed a bit more decadent than the standard issue truffle. The marscapone was almost whipped-like in texture. It did leave me with a slight hint of coffee at the end, but I have to say this one really surprised me. I’d take this over the actual dessert any day. The next one I popped in my mouth also surprised me, but not in nearly as pleasant a way. The Cheesecake truffle had what I think was supposed to be a dusting of “crust” on the top, but it tasted a bit nutty to me. One aspect of cheesecake I adore is the graham cracker crust, so I was disappointed from the get go with this one. The center was sweet. And I mean very sweet. I almost thought I caught a slight hint of coconut, but that wasn’t quite it. To be honest, there really wasn’t a strong flavor at all. Just a sweetness that hit the back of my throat and made me pucker just a tad. Not like a lemon, more like the way a Cadburry Egg does. Sure, I loved them as a kid, but as an adult, they are so sickenly sweet that even looking at them makes my teeth hurt and my throat close. This truffle was, in one sound: eh. 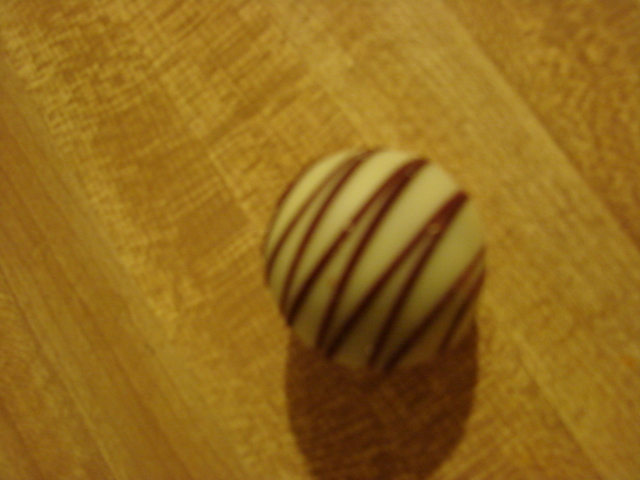 I wasn’t sure what to expect from a Carrot Cake truffle. Once again, I adore the actual dessert, but this one seemed hard to replicate to me. I was definitely a skeptic going in. The “carrot” side had some real pumpkin hints to it. There were little bits of what looked like pureed carrot in it, which I thought helped the texture and idea of carrot cake a bit. Afterall, a good actual carrot cake has the tiniest of slivers of carrot in it. This was also a dual sided truffle and I felt like the cream cheese “frosting” side didn’t really taste like cream cheese. It was just sort of there. Overall, this truffle was fine, but left me feeling a bit blah. I’ll take an actual piece of cake any day over this candy version. I was starting to get a little disheartened at this point. I reached for my next treat: Strawberry Tarte. I had a feeling it was going to be similar to one of my favorite Godiva pieces: the strawberry and cream truffle, only covered in milk chocolate rather than white. I called it. In this particular incarnation, I found the vanilla side to be a bit bland. The vanilla bean flakes were a nice touch and reminded me of the similar flakes I used to find in my Breyer’s ice cream as a kid, but they didn’t pack a lot of vanilla flavor. The strawberry side though was much better. It was sweet and almost jam-like. It was a good combination, but I think I like their original strawberries and cream better. It was good, but nothing new for me. Even though I’d felt I’d tasted it before, the Strawberry Tarte perked me up a bit and made me excited to try the Lava Cake. The powdered sugar top reminded me of the brownies my mom and I always made when I was a kid, which predisposed me to like this piece. It definitely lived up to its name. Just like the actual cake, it had a liquid-like center. If I closed my eyes and could ignore the lack of actual cakey texture, the filling would almost pass for something inside one of those cakes. The drippy fudge inside almost reminded me of warm brownie batter, although it hd had just a hint of bitterness since it was encased in a dark chocolate shell. 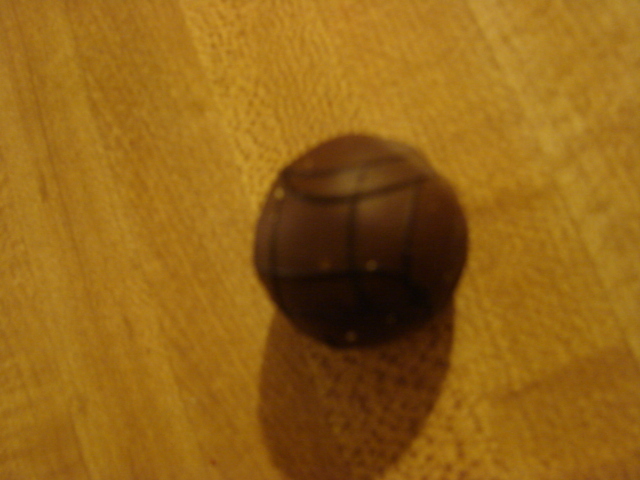 When I got closer to the center, I realized there were actually two chocolates inside: one firmer and more standard truffle-like and the other goooey and liquidy. Both made this truffle really tasty. I know I’ve mentioned it before in this blog, but I am always in search of the perfect red velvet cake. When I saw the last truffle in this collection was an homage to that cake, I knew it had to be my “best for last.” Boy am I glad I saved it! The first bite popped in my mouth. It had a rich, fudgy center which warmed my recovering heart. After my first bite, I glanced in and really liked the red dyed center. There really was an effort to make this one like the dessert. I thought it was an excellent pairing of the white chocolate with such a fudgy inside. It really helped temper it. There was a very subtle undertone I had some real trouble trying to figure out. At first I thought maybe it was almost a fruity sweetness, but I couldn’t finger any particular fruit. I tried to focus instead on the texture of it. Somehow, despite having no actual bits of cake in it, it was really reminding me of the actual cake. For the first few bites, I was almost convinced it had a cake like texture. It wasn’t until the last bite that I placed the strange texture trick and the extra sweetness my brain was foisting on me. The inside tastes like cake batter. This was, without a doubt, the best piece in the collection. I’m so glad I just recently bought another one. Sure, my original intention was to share it with my hubby, but as he knows nothing of it, that has gone right out the window. Overall, I think it was a pretty good collection. Two of the six pieces disappointed me a bit, but they were far from inedible. They were just ok. I’m not sure I’d grab the collection again, but as long as the individual pieces are in the case, I’ll be grabbing extra Tiramisu, Lava Cake and Red Velvet to go. They are tasty and have far fewer calories. It’s a win win for me.